KUALA LUMPUR (Aug 1): theedgemarkets.com has highlighted seven stocks with momentum after the afternoon market close today. 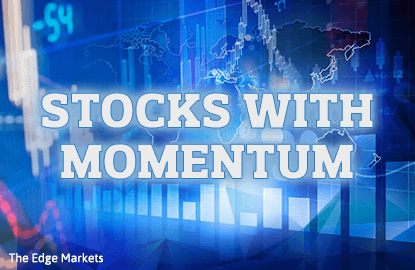 Four stocks show positive momentum while three stocks show negative momentum. This list is not a buy or sell recommendation. It merely tells you which stocks are seeing higher than normal volume and price movements. The share price may move up or down from this point. But the "+ve" (suggesting a rising price trend on volume) and "-ve" (suggesting a falling price trend on volume) indicators should give readers a better idea of what the market is buying and when to sell. Note also that momentum generally only persists for a short period of time.